Kids on Computers received a Yahoo! Employee Foundation grant in 2013 to set up computer labs in Assam, India. A Kids on Computers volunteer who is from this area identified two schools in the Morigaon region that met our qualifications. That volunteer’s family managed the logistics – they found local contacts for us to work with in India, figured out where to stay, and how to travel from the city of Guwahati to Morigaon, where the schools are. For the 2013 India trip we chose a different strategy for acquiring computers. 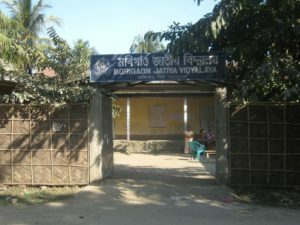 Previous labs had been established with donated computers that traveling volunteers transported to the destination school. Because of the distance from the United States to India and also because of previous transportation difficulties we elected to use the grant money to buy computers in India rather than to carry them.